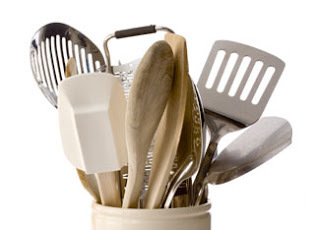 College Cooking: Chapter 4 - Kitchenware Prepare | We Like to Cook! There is an endless array of doodads and hoohaws designed to help with every imaginable kitchen task: strawberry hullers, lemon squeezers, and avocado slicers are among the plethora. If you cannot resist the urge to buy an assortment, try a discount store or a dollar store; that way you will not spend a fortune on gizmos you will rarely (if ever) use. This is also a good way to research different types of equipment to find the type you like. A good example of this is a vegetable peeler. There are many different designs, you may want to experiment until you find the type you like best and then spend your money on a better version for longevity. Knives: A good knife is the most important tool in your cooking collection. Like your sauce pan, you should buy the best knife you can afford. We suggest a good 8-inch (unserrated) chef knife to start out with. For larger hands, you might consider a 10-inch chef knife. Depending on your knife skills and preference, you may decide to invest in a good paring or boning knife as well. A utilitarian set of paring knives can purchased at a reasonable price as well as steak knives for dinner service. A cutting board: Some are thin blocks of plastic, and others are thinner and can bend, allowing you to move food around easier and funnel it into pots and pans. We prefer bamboo boards, but these cannot go into the dishwasher. Be wary of the pretty glass type as they can make a nails-on-a-chalkboard screech that will set your teeth on edge. They also dull the blades of your knives more than plastic or wood. Putting a damp paper towel, damp kitchen towel or piece of non-slip cupboard liner under your cutting board before you start chopping will give you a stable surface to work on safely. Measuring cups/spoons: While it's perfectly fine to experiment with your cooking, you might want to start off by following a recipe and measuring each ingredient. That way, you'll know how to adjust the flavors for the next time. Measuring is very important in baking where the chemical reactions are needed to ensure texture and consistency in your batter or dough. Instawares has a great selection of measuring tools and other brand-name kitchen equipment at affordable prices. A Spatula (flipper): It's a little like the Swiss army knife of kitchen tools. We suggest that you get two: one that is a square metal version with a sturdy handle and the other a silicone/plastic spatula for your non-stick pans. Wooden spoons: Super cheap and super useful! Stir sauces, eggs, prop the oven door open; a definite must-have. Grater: Wonderfully useful for cheeses, carrots, zucchini, potatoes or even stale bread for bread crumbs. Peeler: Another inexpensive and indispensable tool. Perfect for potatoes, apples, lemon zest, shaved cheese and chocolate curls. Kitchen Scissors: An inexpensive pair of scissors dedicated to cooking can be incredibly useful. We use ours to snip herbs, cut chicken, trim the fat from meat, clip parchment to fit a pan – you get the idea. Can Opener: It's one of those small things that you forget about until you need it. Be sure to get a keyhole opener as well. Wine bottle opener: Even if you are not old enough to drink, some bottles like artisanal olive oil or specialty vinegars come bottled with corks. Mom and Dad would probably appreciate your having one handy when they visit too. Towels: We call them “mupines” and we never seem to have enough! We buy bundles of towels or bar mops at Costco and use them for everything. They are far more durable and less expensive than paper towels. Pot Holder: Best to have a few of these. Make sure they are thick enough to properly protect your hands. While we like the silicone ones, they can get slippery and some of them are simply too small to be effective, so choose wisely. Remember if you use a towel as a potholder, make sure it is dry. A wet towel can cause serious burns. Homework: Practice (practice, practice) your knife skills. Experiment with knives of differing different shapes, lengths and weights to find which best fits your hand for comfortable slicing and chopping. The more comfortable you are using a knife, the safer it will be for you to use one. You should also remember that a sharp knife is safer than a dull one. Great article. In my opinion one of the most important tools in your kitchen is a knife, and therefore the most essential kitchen gadget has to be your kitchen knife sharpener. More specifically, I only trust the DMT knife sharpening products since they are made in the USA and come with long-standing warranties. I would definitely recommend checking them out if you're in need of an effective blade sharpener.